Buckwheat Chocolate Chip Cookies! 1 bowl. 1 flour. Easy and beyond delicious! 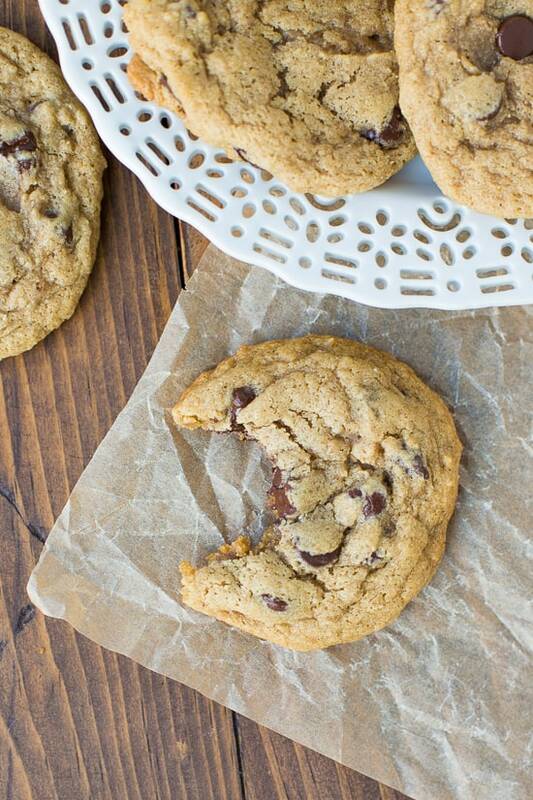 Sometimes you need a warm, gooey chocolate chip cookie. And sometimes (all the time for me…) you need that cookie to be gluten-free! And you don’t want that cookie to wipe out your kitchen with flour and dishes. Not to mention your grocery budget tracking down a ton of weird ingredients. These cookies are the cookies you need! 1 bowl. 1 flour. And beyond delicious. These buckwheat chocolate chip cookies are perfect to make on Friday night to munch on while catching up on your favorite shows. Or the perfect thing to make while your kids’ friends are over and you want to make a treat. Or when it’s Sunday night and making cookies is the perfect way to bite the weekend-ending-blues. There are so many times in life that call for delicious chocolate chip cookies and this recipe won’t let you down! These cookies only require one ingredient for the flour – buckwheat groats ground into flour in the blender. I put together my first ever cooking video to show you how easy it is. Don’t forget to subscribe to my channel on You Tube for more videos! Buckwheat is a hearty pseudo-grain that sounds like it would be related to wheat, but is actually totally gluten-free. I love buckwheat in so many gluten-free recipes (here. here. here.). Buckwheat gives these cookies the fantastic texture and flavor. They hold together perfectly and strangely remind me of the flavor/texture of cookies from Subway sandwich back in the day? See for yourself! 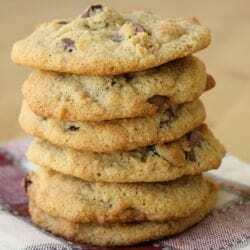 These Gluten-Free New York Times Chocolate Chip Cookies from Gluten-Free on Shoestring also look delicious! UPDATE: We love these cookies and make them often! I actually decided I like these the best made with Earth Balance Buttery Sticks. When you use the Earth Balance they taste just like the famous Toll House chocolate chip cookies! 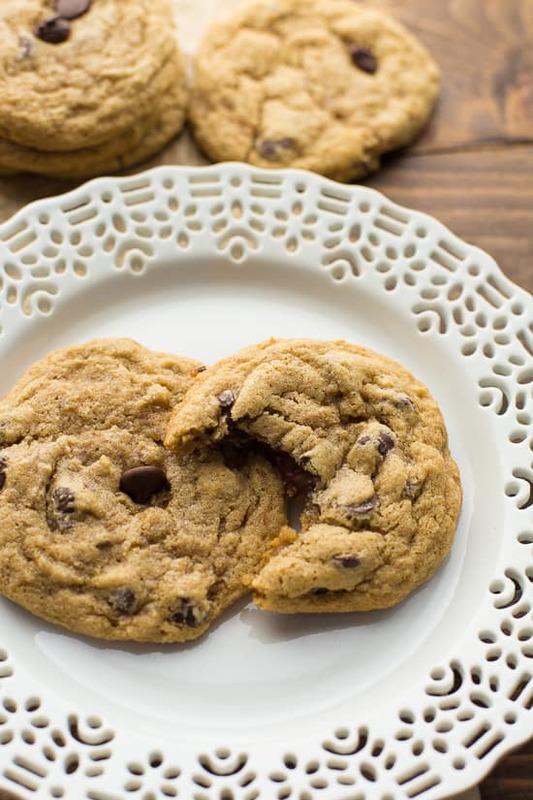 This is my go-to chocolate chip cookie recipe! 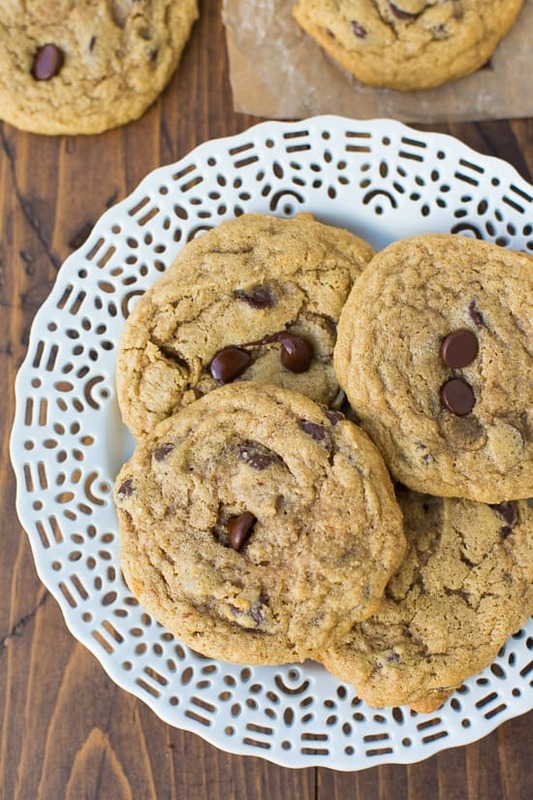 You’d never guess these cookies are gluten-free and they couldn’t be easier to make. It is important to chill the dough so the cookies don’t spread too much. I usually let mine sit for at least 3 hours or up to overnight. 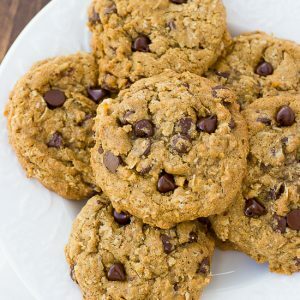 These cookies also turn out great made with Earth Balance Buttery Sticks instead of the butter to keep them totally dairy-free. Place the buckwheat groats in the jar of a high-speed blender. Blend into a fine flour. In a mixing bowl, add the butter, brown sugar, and white sugar. Blend until smooth. Add the egg and vanilla and blend until creamy, about 2 minutes. Add the buckwheat flour, baking soda, and salt. Mix to thoroughly combine. Stir in the chocolate chips. Refrigerate the dough for at least 1 hour, or overnight. Preheat the oven to 350F. Scoop the dough into mounds onto a lined baking sheet. Bake for 12-13 minutes. Let cool on the pan for 2-3 minutes, then scoop out onto a cooling rack. Enjoy! MAKE IT DAIRY-FREE: Use vegan butter such as Earth Balance in place of the butter. Ah this look soooo good!! Question, are these cookies soft and chewy or more crisp? I definitely am more of a soft cookie person! 🙂 also, how many cookies does this make?? Thanks so much Erin! Your recipes are amazing! 1 1/4 c buckwheat groats), how much buckwheat flour for this recipe? Is it still same amt as groats…1 1/4 c buckwheat flour? Hi Shirley! I would try adding 1 1/4 cups + 2 tablespoons buckwheat flour. I think that should work great. Let me know if you try them! They look just like the original CCC–wow! We’re making these tomorrow for sure! Love your cute video too!! Hey! Amazing recipe!, i want to do these but in my house theres only organic unrefined sugar, not sure how its called in english. Moscovado sugar maybe? Well, anyway, i would like to know if it is possible to replace all the sugars in the recipe for this or others like honey or molasses. Thank u! These cookies would be great with coconut sugar! I hope that helps. Just curious…why pure buckwheat flour instead of your grain-free flour blend? Do you just find it tastes better? These are amazing! I actually discovered that I prefer to bake the dough immediately, because the cookies tend to be tall anyway, and they got a little too caky for my personal tastes when the dough was chilled. I’m making these for my daughter who has Hashimotos and can’t have gluten. Thank you! I am new to buckwheat, having discovered it recently when my chiropractor took me off of gluten. I made these cookies for the first time this evening and oh my goodness, they are fantastic! I used buckwheat flour (1 1/4 cups) since my health food store does not carry raw groats. I baked them a bit longer, about 18 minutes, to get them crunchy (that’s the way I like them); but the next batch I will bake about 15 minutes to get a softer cookie the way my family likes them. 🙂 This recipe will make well over a dozen cookies; I have made 20 of them already and haven’t even used half the batter. I’m so glad you liked the cookies! Thanks for the comment 🙂 Good luck with the gluten-free diet! How is it Vegan if you’re using an egg? Is there an egg replacement that would work in this recipe? I think a flax egg would work really well in these cookies. Let me know if you try it! Why is pre packaged buckwheat flour so dark? 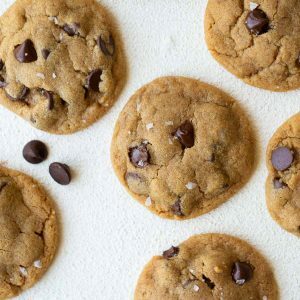 Could this recipe be made completely vegan by using coconut oil, instead of butter and a “flax egg,” instead of the egg (and of course, making sure that the chips are vegan as well)? Also, will your blender technique work with a regular household blender without needing a Vitamix? Thanks. Can we actually substitute sugar for coconut sugar or maple syrup?